Everyone seems to love the Portland International Airport. (IATA code: PDX.) What makes it so great? It’s no one attraction or amenity. It’s things like security and customs that just seem to work better than at other airports. It’s the free Wi-Fi. It’s the easy and quick (38-minute) light-rail connection to downtown. It’s the canopied roadways, vastly improving the dignity of a dash from the parking garage to the terminal in the rain. It’s healthy food that costs the same as it would in a downtown restaurant (there’s actually a rule about that), and solar panels on the roof making you feel better about your carbon footprint. Welcome to the airport that renews our faith in 21st-century travel. At some airports, fast-food options are limited to burgers and pizza. But not at Travel+Leisure magazine’s 2013 U.S. airport of the year. 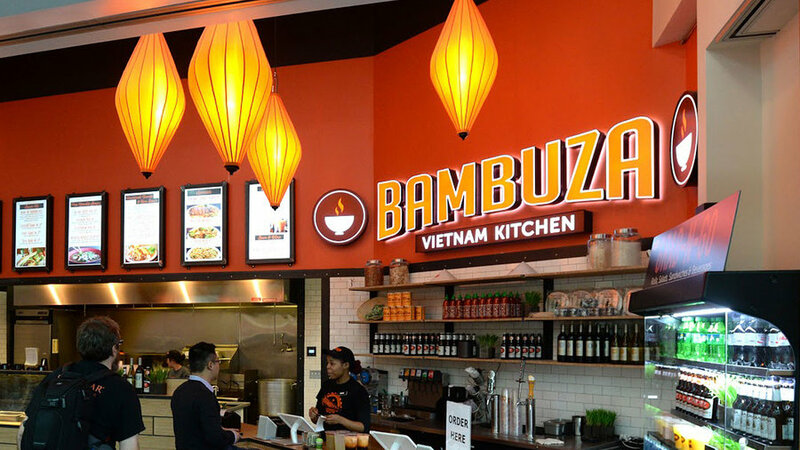 A healthy and quick option is Bambuza Vietnam Kitchen (pictured), on Concourse C in the South Terminal. Pho and bánh mì will get you through your flight without inducing a food coma. Also on Concourse C, Café Yumm is worth a visit just for being the most Portlandia-like of all the airport concessions. They offer options free of meat, gluten, trans fat, sugar, pesticides, and antibiotics. They even welcome that Pacific Northwest rarity, the omnivore. Too much? Meet up with the other carnivores at Burgerville, on Concourse D.
You might think that the farm-to-table concept is something you have to let go of when you’re traveling, but you don’t if you’re traveling through Portland International—especially the North Lobby, which is where you’ll find The Country Cat. Here, indulgent comfort food—ham, fried chicken, biscuits—is made from scratch using mostly farmers’ market-sourced ingredients. 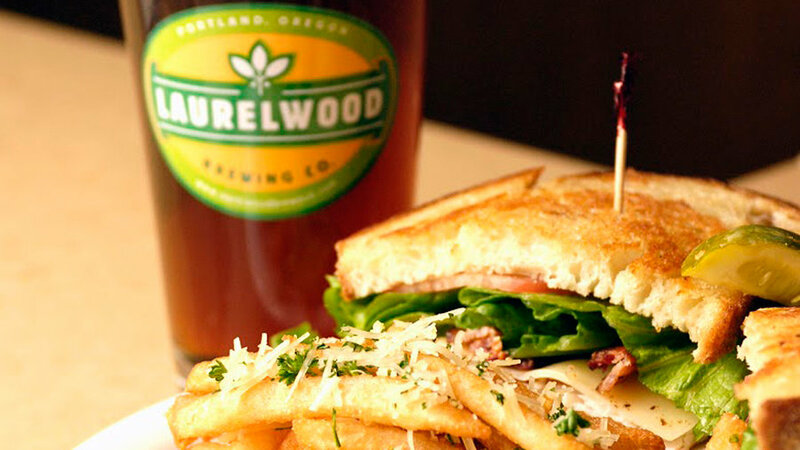 On both Concourses A and E, outposts of the Laurelwood Public House & Brewery (pictured) serve filling pub grub paired with handcrafted ales. You obviously aren’t in any position to zip up to the Willamette Valley while you’re waiting for your flight, but it can come to you at Capers Café, in the South Lobby. Discover your new favorite Pinot at this wine bar specializing in wines of Washington and Oregon. 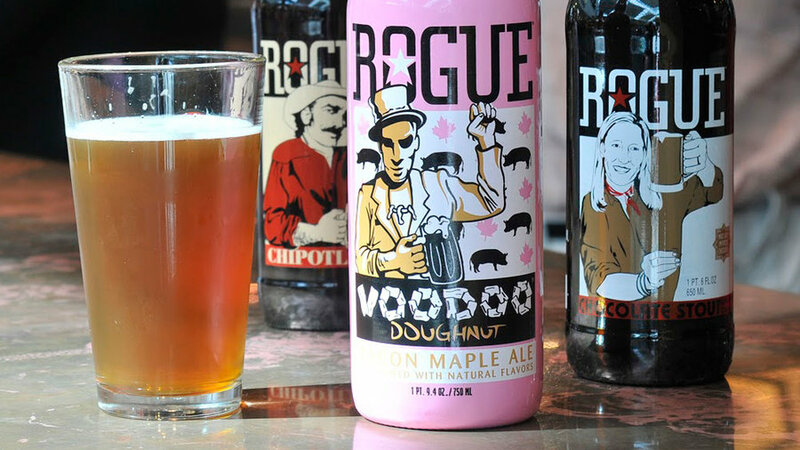 If beer is more your thing, make your way to Rogue Ales Public House (pictured), on Concourse D. This pub serves a dozen or so beers on tap made by Oregon’s beloved Rogue brewing company. You might have seen the good beer and wine coming, but tequila? You can sample more than 200 varieties (not in one sitting—no layover is that long) at Sandoval’s Tequila Grill, on Concourse C.
PDX is a healthy place, but there’s butter and sugar to be found if you know where to look. 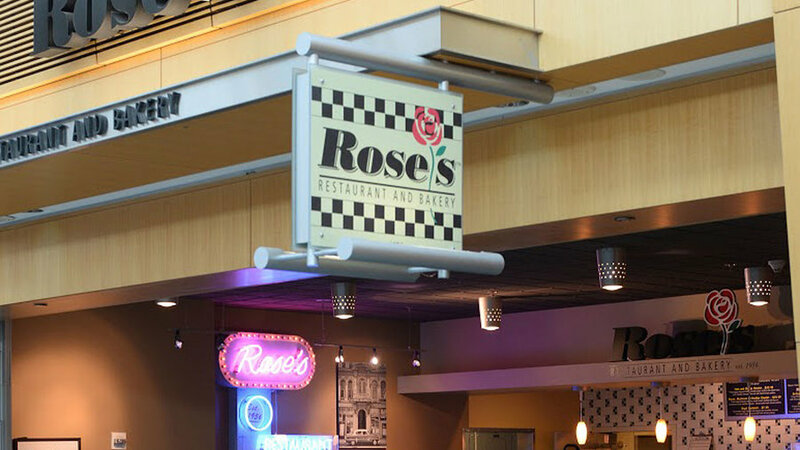 In Concourse D, stop by Rose’s Restaurant and Bakery (pictured), which openly sells baked goods such as cinnamon rolls and creamy pastries. (The company has been in business in various Portland locations since 1956, which may be why the dairy and gluten police look the other way.) Another fun indulgence if you have the time is a double chocolate brownie sundae from Henry’s Tavern, a sit-down restaurant on Concourse C.
You’re officially within the city of Portland, so you can find passable coffee just about anywhere. The same can be said of Starbucks locations—there are five in the airport, making them hard to avoid. But consider trying, because almost as ubiquitous here are outposts of Coffee People (pictured). 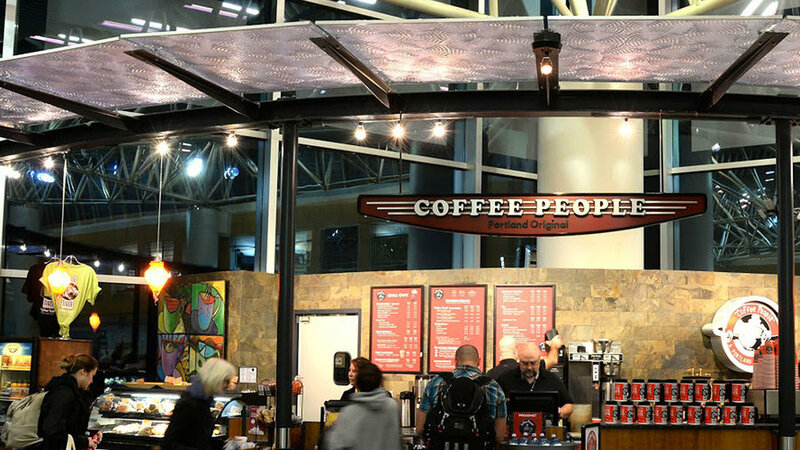 Portlanders suffered a scare when Starbucks purchased the Coffee People company a few years ago, but the airport kiosks were mercifully spared inclusion in the sale and retain their independent branding. They’re located in Terminals B, C, and E, and in the North Lobby. As befits a city awash in craft beer, Pinot noir, and independent distilleries, many souvenirs worth taking away from PDX are in liquid form. Several shops located past security make it easy to bring these fluids home. 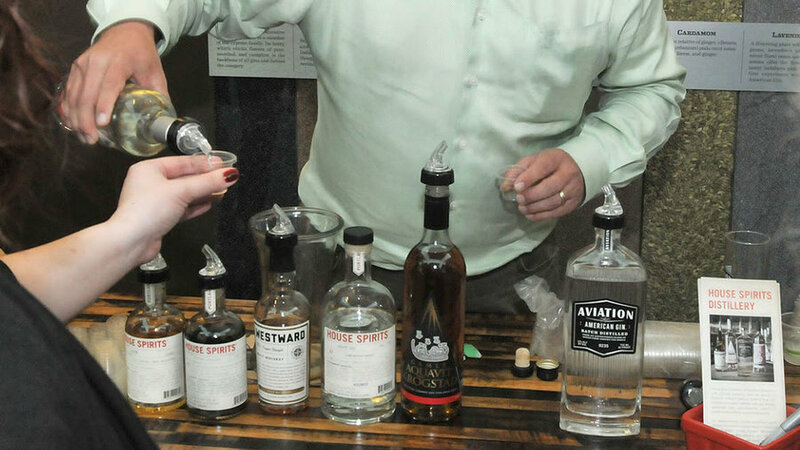 At House Spirits Distillery (pictured, of Portland’s Distillery Row fame), you can take home a bottle of Oregon cheer. They’re on Concourse C. Our recommendation: Aviation American Gin. Capers Café (in the South Lobby) is another good stop for a gift bottle if wine is more your style. For treats you can sink your teeth into, try Your Northwest Travelmart. They sell made-in-Oregon gift items like marionberry jam. Find locations on Concourses A, B, C, and D.
Penny-pinching airport shoppers have two things going for them at Portland International Airport. One is Oregon’s lack of sales tax. The other is a rule established by the city stating that airport stores can’t charge more than they do in off-airport locations. 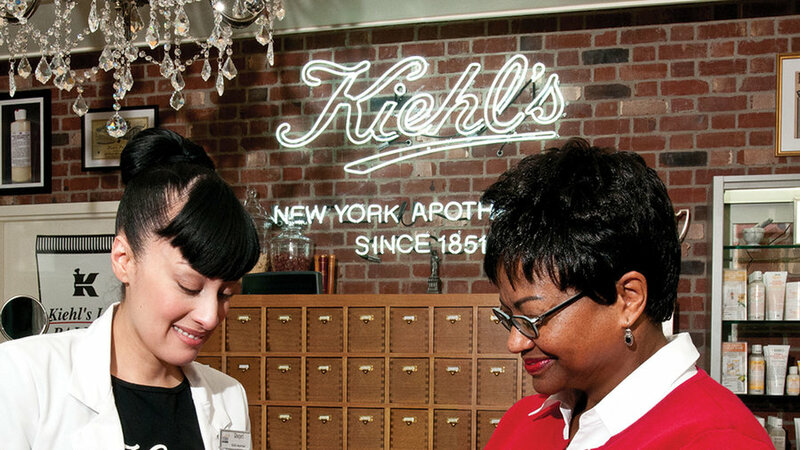 This makes PDX an excellent place to shop national chains like Brookstone and Kiehl’s (pictured), both in the South Lobby. And don’t overlook Oregon companies like cc McKenzie, featuring quality shoes and apparel for women on Concourse C. Also fun to shop if you have the time is the Oregon Market. This shopping mall within the airport (but outside of security) has outposts of many iconic Portland brands like Nike, Pendleton, and Powell’s Books.